Just Announced: GARTH BROOKS Returns! December 5, 2018	What's Happening in BOB Country? 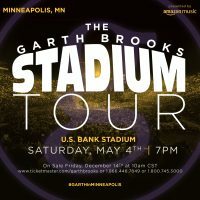 Garth Brooks returns to Minnesota on Saturday, May 4th, performing at U.S. Bank Stadium! Tickets go on sale Friday, December 14th at 10:00 am! Stay tuned for more ticket information!